Fresh veggies and Wisconsin gouda cheese make this recipe special. 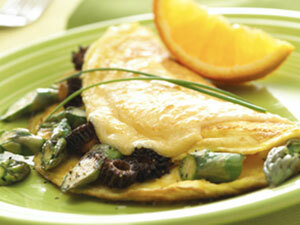 Mushrooms and asparagus are folded into eggs that have been whipped with crème fraiche. To finish, gouda cheese is melted on top. Clean mushrooms and cut into 1/4-inch rings (strips if using shiitakes or portobellos). Trim the asparagus, peel the bottom 4 inches, and cut thinly on the bias. In nonstick skillet, heat 2 teaspoons of the oil over medium-high heat. Sauté the mushrooms until fully cooked, about 2 minutes. Season with salt and pepper; set aside. Repeat the process with the asparagus. Set aside. In an 8-inch nonstick omelet pan, melt 1 teaspoon of the butter over medium-high heat. Add half of the egg mixture. Using a rubber spatula, lift the cooked egg at the edges, tilting the pan so the uncooked egg flows to the exposed pan. Cook until eggs are set but still shiny. Remove from the heat. Spoon half of the vegetables onto one half of the cooked eggs. Flip the uncovered half over the vegetables. Roll onto a small baking pan. Repeat with the remaining egg mixture and vegetables. When both servings have cooked, place two thin slices of cheese on top of each omelet. Place the pan under the broiler until the cheese is just melted. Serve immediately. Substitute shitake or portobello mushrooms if morels are unavailable.